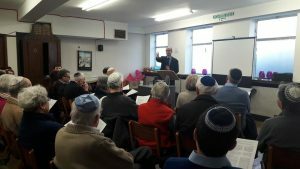 Over 150 people were part of the Hampstead Synagogue Spirit of Hampstead Festival on 25th February 2018, organised to celebrate the synagogue’s 125th anniversary. 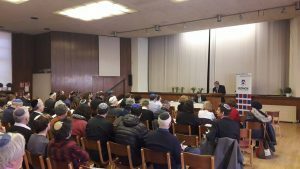 Organised with Mizrachi UK and supported by the Chief Rabbi’s Centre for Community Excellence, there was a diverse and rich programme featuring speakers and educators from the USA and Israel as well as more local contributors. There was something for everyone covering Torah, Israel, Politics, culture and humanitarian activity with sessions ranging from Rabbi Jeffrey Saks on ‘The Miracle of Faith’ to Steven Feldman on Mapping Israel from biblical times to today and Howard Jacobson in conversation with Professor Anthony Julius. In addition, the Festival took the opportunity to collect food donations for FEAST! a charity that cooks meals for homeless people in West Hampstead. A highlight of the day was hearing from Benny Davidson who in 1976 was flying for the first time and looking forward to his bar mitzvah when his plane was hijacked and rerouted to Entebbe.